Variable options to boost system computing performance - Equipped with a PCIe 3.0 slot, RS1619xs+ supports installing a 10GbE/25GbE NIC for fast data transmission. Built-in M.2 2280 SSD cache slots further benefit IO-intensive tasks, such as virtualization or mail server deployment. design Of all of the latest Synology Releases for 2018/19, the RS1619XS+ is by far the most interesting model of all. It is the latest XS series NAS and available in jsut 4 bays. The design is both sleek, 1U and they have managed to include a large amount of power and coverage in this device. Featuring 10Gbe, 4 LAN and all the business hardware and chassis you would expect from Synology. features Fantastic hardware options inside mean that this rackmount NAS provides excellent potential for business users. This combined with support for RAID options mean that this device is designed for the long term. Additionally, it features a 5 year warranty and 3 years of the SRS (synology replacement service), so you have great failure support too! performance Excellent performance thanks to the 4 LAN, great Intel CPU, lots of memory and the PCIe slot that can be used for the M2D18 NVMe SSD Cache card or 10Gbe connectivity. features It does not arrive cheap and the features and functionality to not arrive at a home user budget - nor would you expect it too! value Some users might want more storage at this price level. 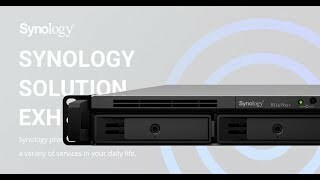 If you buy this Synology RackStation NAS and hard drives we do free build and test for the unit and hard drives. So you can use this device straight out of the box. All free of charge in RS1619xs+ price.